Play is the best way for our children to learn. Play is open-ended and directed by the child. Play does not have learning outcomes that are pre-determined by parents, teachers or game designers. When I evaluate our preschool’s math curriculum, usually during the summer when I have time to delve, I look at how young children learn, how gifted children learn, how mathematically talented children learn, and what eminent mathematicians have to say about teaching math. Here is my favorite article: A Mathematician’s Lament by Paul Lockhart. It is 25 pages long, so brew a cup of tea and settle in for a good read. There are as many philosophies about teaching math as about teaching reading – with as much antipathy between the believers. I believe in a constructivist approach, but you can find plenty of research that supports a traditional skills-based approach to teaching math. We work with highly capable children at my preschool, the vast majority of whom will enter gifted programs and many of whom in addition to being bright little whippersnappers have a special affinity for math. These kids light up at the idea of infinity. They create complicated patterns: last year a girl designed one that was 13 objects long, alternating colors, materials and angles of the objects. These kids beg their parents to “do math” with them at home. Math activities at Bellevue Discovery have evolved since we opened in 2007. For several years I adapted Mathematics Their Way, a well-thought out, hands-on curriculum that has been used in primary gifted classrooms and moves topic by topic through the year. One year I conducted lengthy math assessments of each child in September and divided the small groups by math ability (tracking in preschool!). Yet even groups of four don’t allow sufficient differentiation when math activities aren’t open-ended. I did a major overhaul of our math program a few summers ago, looking again at best practices for working with young gifted learners and concluding we needed to focus on math games. Then what should we do with young children in math class? Play games! Teach them Chess and Go, Hex and Backgammon, Sprouts and Nim, whatever. Make up a game. 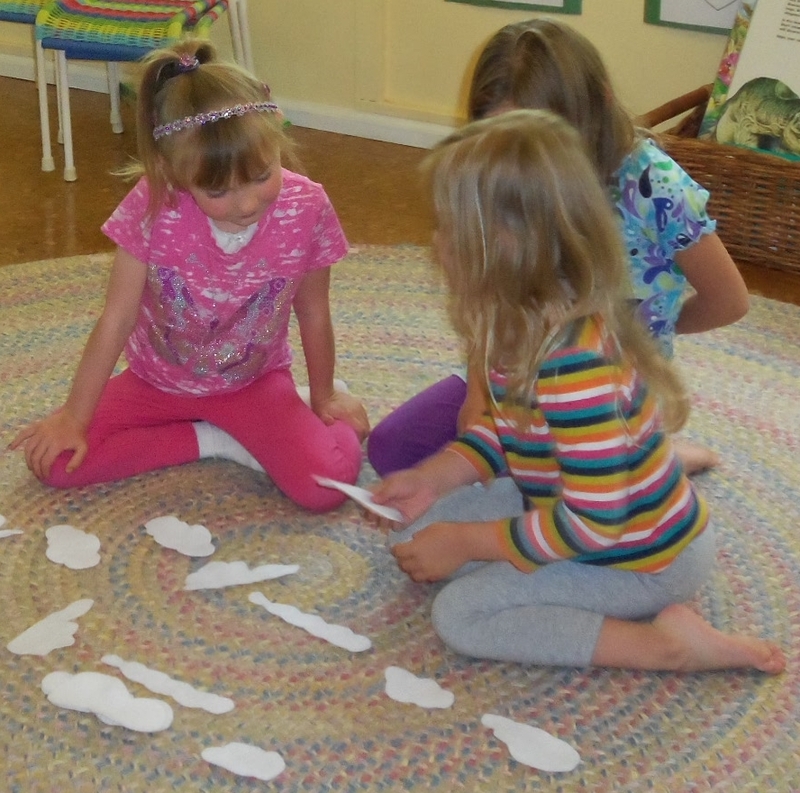 Do puzzles … help them to become active and creative mathematical thinkers. Our current Math Games teacher, Miss Erica, uses a checklist based on the NCTM’s math strands and general skills for pre-K through first grade. We’ve moved away from going topic by topic through the year: number, geometry, measurement, data analysis, algebra (patterns). Instead, Erica chooses math games based on her relationship with the children: what will thrill them? Our kids like variety and challenge. They love learning new things. They are still learning gamesmanship: sharing, waiting turns, playing by the rules and healthy competition. They are at different places in their mathematical thinking and if they are actively engaged we can trust that they are learning at their individual level. We use real objects, especially when we can tie the math game to our ongoing class project. 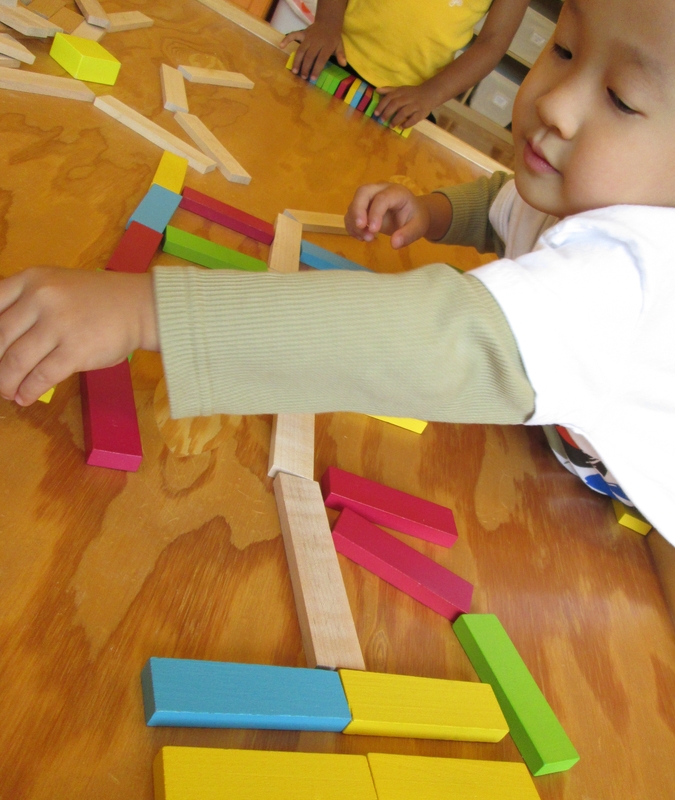 We use store-bought and teacher-made manipulatives (little objects kids can hold and move to explore ideas). We use card games, puzzles, and old favorites like Set, Mastermind, Mousetrap and Chutes & Ladders. We’ve tried teaching chess, but find it needs an adult for every preschooler to be effective. Sometimes Miss Erica creates a game based on the children’s literature we are reading that week. We use math tools like rulers (we make our own with only the inch marks), abaci, dice, spinners and tally sheets. Our math materials are similar to a typical kindergarten or first grade classroom. It’s what we do with them that is different. We don’t focus on simple content during Math Games. We have a different math time, in the middle of our morning Sing-Along, when we talk about the number of the day and build a model of the number with popsicle sticks. This simple visual counting practice, which takes a few minutes each day, builds over the year so that by the spring the kids are counting by tens, talking about hundreds, and growing in number awareness … not just counting to 100 by rote. They also write one number a day, which is all it takes for most preschoolers to be able to write their numbers by the end of the school year. For our real math we play games. We talk. We laugh. The children ask questions. They answer each other’s questions. They use their hands to move objects around. They debate ideas. At some point the quietest child speaks up. The teacher does not have a lesson plan that says the children will learn these three things. We don’t know what the children will learn, but we know that if they are engaged, reasoning, creating patterns, using numbers for a reason, and asking questions about the game, their level of learning will be high. At the end of the week Erica checks off the math topics the children experienced through their games – which may not be the ones she thought a particular game would present. If a math strand hasn’t had much exposure she looks for games and activities to fill in the gap. We conduct quick math assessments to ensure our children are gaining the math skills and knowledge they will need for advanced kindergarten classes. In the spring, when we know where our children will move on to kindergarten (different schools want different levels of worksheet mastery) Erica moves the pre-K kids into school-readiness math: using symbols, learning how to complete a worksheet, copying a simple math problem from the whiteboard, etc. We believe young children learn best by building their own understanding of our world, and our world includes the beautiful realm of mathematics. There will be a time for memorizing math facts, but preschool is not that time. 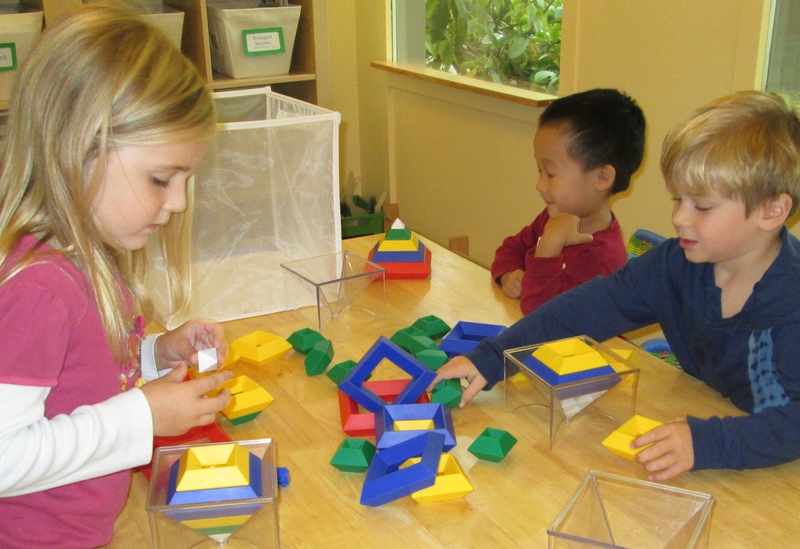 Preschool is the time to build a rich foundation of mathematical awareness and joy. Play games. Play with numbers. Play with patterns. Ask questions. Imagine. Know that there is not one right way to get to one right answer. 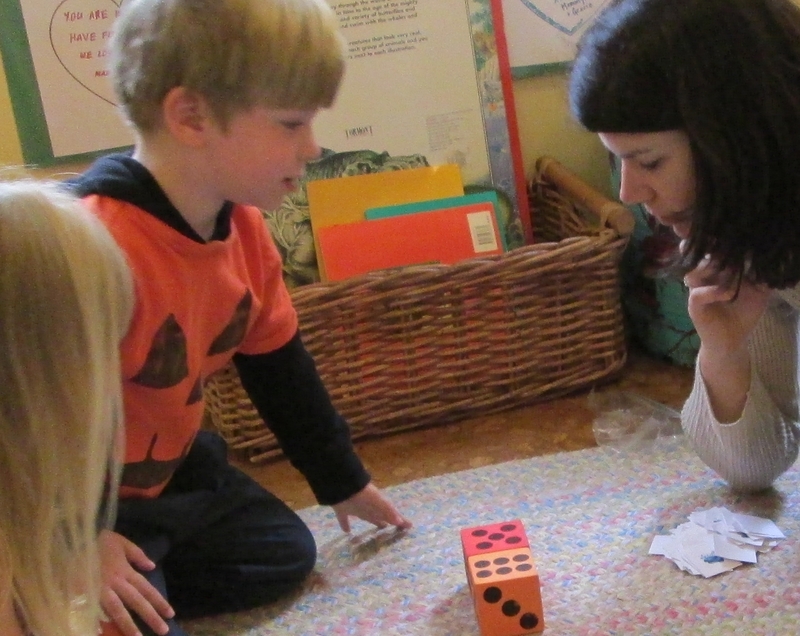 About the article that kicked off this blog, Preschool Math: Education’s Secret Weapon: the e-game sounds fine as a limited part of a child’s math experience. Kids love the bells and whistles of educational software, and I like it that the program accelerates the children through the concepts when they demonstrate understanding. No e-game, however, will transform preschool math learning. “Virtual manipulatives” (the game designers’ phrase) is an oxymoron. Young children need real objects that they can hold and turn around in their hands, physically move, and explore with all their senses (except taste … one day I heard myself tell a preschooler, “We don’t do math with our tongues.”) It sounds like a fun computer game and it can probably teach some skills and concepts, but a great rule of thumb is that if something “educational for preschoolers” costs money, you can probably do a better job teaching it while playing with your child. This entry was posted in Early childhood, Education, Gifted children, Teaching Math and tagged A Mathematician's Lament: How School Cheats Us Out of Our Most Fascinating and Imaginative Art Form, Preschool education. Bookmark the permalink.